The murder attempt of Haflong’s Food & Civil Supplies officer, Rupam Dibragede alias Donald, has taken a new turn after the arrest of two persons on Sunday in this connection. It may be mentioned that Rupam Dibragede received bullet injuries after he was shot at by an armed miscreant in his office at Haflong, the district headquarters of Dima Hasao, on Saturday afternoon. Within 24 hours after Rupam was shot, Haflong police were able to arrest the mastermind of the firing incident, Babu Chetri and his associate H Kuyam on Sunday. 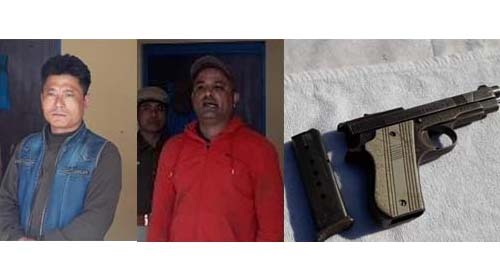 The weapon which was used to shoot Rupam – 7.65 mm pistol – has also been recovered by police. 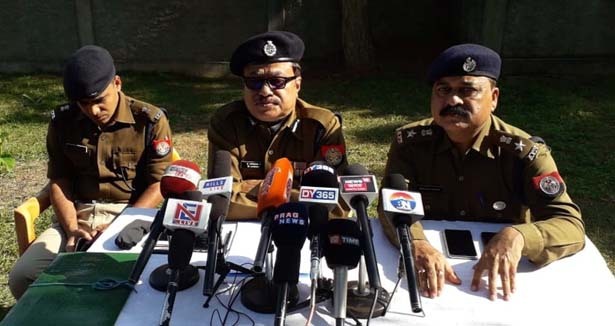 However, the main accused in the incident has fled towards Dimapur,” Debaraj Upadhyaya, DIGP, South Range, told media persons during a press conference at Haflong on Sunday. In order to keep maintain peace in Haflong, the top police official also sought co-operation from the political leaders and the conscious section of the people. However, when asked regarding the kidnapping of a 70-year-old villager from Wajao village in Maibang sub-division of the district, he did not reveal anything. However, he said that investigation was going on. Stating that no organized out is involved in the kidnapping incident, the police official said that a criminal gang has done it for money. It may be mentioned that DIG Upadhyaya arrived in Haflong last night itself to take stock of the situation after the incident. According to information, there has been a business-related conflict between Rupam alias Donald and Babu Chetri. The conflict increased after Rupam returned to Haflong after being transferred from Diphu and Babu allegedly hired a professional killer from Dimapur with the help of H Kuyam. Now, police are interrogating Babu and Kuyam.